PartyLine connects you with people from all over the world in a live one on one voice chat. Search by age or gender. Lets talk! • Doesn’t use any of your voice minutes – since the app is voip-based, none of the voice minutes for your phone contract are used. • Universal app that works on iPhone, iPad, or iPod touch. • Cellular or Wi-Fi – works over just about any network and firewall with very low bandwidth (less than 1.5K/sec upstream and downstream). • Match with anyone anywhere in the world. • Rating system to discourage rude behavior. • Friend system to allow for future conversations with people you like using push notifications. • Currently there is only one universal room, but future updates will have different location based chat rooms. 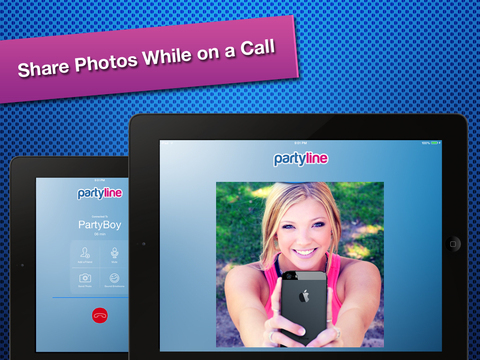 PartyLine - The ultimate talk line. Get on the Party Line. ENGLISH ONLY: Presently PartyLine is only available for English-only conversations. Other languages will be added later. • During calls, you can now attach photo's from gallery instead of only snapping photo's. • Ability to purchase rating points. • "Pick My Match" allows you to choose people to talk to. • Earn 1 credit for every 10 minutes you talk to someone new. • Earn free credits by telling your friends about PartyLine. Thank you for using PartyLine! Please reach out to support@partyline.me or @partyline with any issues or suggestions. The partyline team listened to what you wanted, and we released the much anticipated 2.0 version. -Enhanced the friend calling feature so you can directly request a call with your friends. Minor bug fixes an enhancements. It's cool to see something different for a change. Lots of fun when you're bored. A must try.